NEW YORK – I decided to ask some of the Giants fans and friends I’ve met on twitter, over the past 2 seasons, what their predictions for Super Bowl winners and/or final score predictions would be. I will list their answers below, I think most of us are on the same page. Some do not want to make a prediction in fear of jinxing the game but I do not think this qualifies as such amongst friends. This is simply guessing for fun and checking out what some of the NFL fans have to say because let’s face it, we all have an opinion on the Super Bowl. Get ready for a party Indianapolis. I started this poll on the Pro Bowl day 1/29/12 and will post it on 1/31/12. Somehow people think the Giants are the underdogs in this game which is fine by Big Blue. The truth is everyone knows that the Patriots are the true underdogs. Some of the New England players have decided to focus on setting up parties before winning the game. Typical and predictable actions of a second place team. The Giants will focus on winning the game and how to ruin Patriots QB Tom Brady’s day. If you want to get some official New York Giants gear, click on the banner on the right sidebar. You can buy great Super Bowl XLVI merchandise from the Giants official store but we don’t set up victory parties in New York until we’ve won something. Let’s take a look at some of the final score predictions via twitter accounts. If anyone does not want their prediction listed, simply send us an email at nygreporter@yahoo.com and request to have it removed. Also, it you would like yours added to the list send me a tweet and I will add it. Final score predictions must be in before the game starts on February 5, 2012. 1. 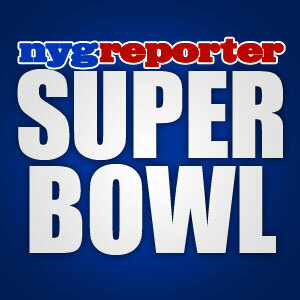 @nygreporter – Giants win 38-27. 2. Angelina Jolie – Patriots win – No final score given. 3. Brad Pitt – Giants win – No final score given. 4. @nysportsbabe – Giants win 28-24. 5. @BIGBLUE3NY – Giants win 27-24. 6. @MelissaNYG – Giants win 30-20. 7. @JayOTC – Giants win – No final score given. 8. @KrissyLachelle – Giants win 31-24. 9. @gman_bird – Giants win by 2 scores. 10. @NYdocski – Giants win 28-21. 11. @NYGiantsPapi10 – Giants win 31-17. 12. @JaimiePaladino – Giants win 23-17. 13. @GODSONN – Giants win 29-24. 14. @MarcSDuffy – Giants win 38-31. 15. @NY_SportsNews – Giants win 28-24. 16. @Teaieal – Giants win 24-17. 17 @NataliaYank2530 – Giants win 33-30. 18. @OriginalDRose – Giants win 30-24. 19. @PatCDev – Giants win 31-14. 20. @melonsports – Giants win 30-24. 21. @theknickswall – Giants win 34-20. 22. @krishan_mamba24 – Giants win 30-24. 23. @DonCalzoneVIP – Giants win 27-17. 24. @stanbhoy – Giants win 31-24. 25. @JoshBerman – Giants win 27-14. 26. @ErinSharoni – Giants win – No final score given. 27. @AllJerseyRadio – Giants win 28-21. 28. @NatalieL22 – Giants win 31-20. 29. @Rissachaela2 – Giants win 32-24. 30. @EAMaddenNFL – Giants win simulated Madden game 27-24. 31. Bobby G – Giants win 37-14. 32. @Stefiegirl820 – Giants win 27-24. 33. @NY_Giantsrock – Giants win 28-24. 34. @JerzBoy21 – Giants win 38-31. 35. @dj_elle – Giants win 35-24. 36. @SuzyQOB – Giants win 27-20. 37. @ajcnj56 – Giants win 31-28. 38. @SportsTechieNET – Giants win 24-21. 39. @GMEN36 – Giants win 24-21. 40. @nocycle – Giants win 24-17. Feel free to leave your own final score prediction in the comment area. Leave your twitter info too. What is your final score prediction for Super Bowl XLVI? This entry was posted on Tuesday, January 31st, 2012 at 5:05 AM and is filed under 2011 New York Giants, 2011 NFL Playoffs, 2011 NFL Pro Bowl, 2011 NFL Regular Season, 2012 Pro Bowl, A Journey for 9/11, Big Blue, Bill Parcells, Chris Mara, East Rutherford, Eli Manning, Ernie Accorsi, G-Men, Giants, Giants Coaches, Giants Front Office, Giants History, Giants Roster, Giants Stadium, Giants Super Bowl History, Jerry Reese, John Mara, Jonathan Tisch, Justin Tuck, Kevin Gilbride, MetLife Stadium, New Jersey, New Meadowlands Stadium, New York, New York Football Giants, New York Giants, NFC East, NFL, NFL New York Giants, NFL Playoffs, NFL Pro Bowl, NFL Schedule, NFL Super Bowl, NY Giants, NYG, NYG Blog, NYG Charity, NYG Exclusive, NYG Fantasy Football, NYG Playoffs, NYG Pro Bowl, NYG Regular Season, NYG Reporter, NYG Road Warriors, NYG Schedule, NYG Story, NYG Super Bowl, NYG Website, nygreporter, Pat Hanlon, Perry Fewell, Roger Goodell, Steve Tisch, Sunday Night Football, Super Bowl XLVI, Timex Performance Center, Tom Coughlin, Tom Quinn, University of Albany, Wellington Mara. You can follow any responses to this entry through the RSS 2.0 feed. You can leave a response, or trackback from your own site. Thanks for putting my prediction on the board even though im not on twitter.your a classy dude rob.its interesting that all the scores vary from one another. however,,i know all nygiants fans will be happy with the outcome of this superbowl.I already thanked GOD for the g-mens victory over the patriots sunday at indy.therefore it is done. Hey Bobby, it’s my pleasure, I should have put it up sooner but just happen to be writing them, as I checked the reply messages. It’s getting close to the SB now man! We cant wait until sunday.just thinking of different foods to stuff our faces with buddy lol. Im all jazzed up waiting for sunday.i just had 3 espresso,s before i go to work.i clean a restauraunt here in florida at night ,and all the tv,s are on while i clean.im watching all these press conferences saying lets kick it off already.2 rule changes next year buddy,no pro-bowl and no bi-week before the supe lol.i was reading gary myers column,and he talked simple mathematics.the g-men are a better team now then they were in 07,and the patriots are not as good as they were in 07.the simple math projection is the g-men are and should be 11 point favorites.i have them winning by 23.do you have another article before the show,or will this be it until you right your nygiants victory article this sunday night.because its going to be like new years eve and i will respond no matter how late or into the wee hours you write it, lol.lots of bostonians in this area this time of year and there chirping big time.thats alright,they all will be in hiding after the game,like they were in 07 after the superbowl lol. I was getting pumped up too buddy. I cant wait for Sunday to get here. Hey rob,i was watching these press conferences and all of a sudden i think about ocho cinco.is this guy the forgotten man that belechick thinks the g-men forgot about.with gronkowski and welker and even hernandez bottled up,i do not want to see chad running open downfield.that would be disgusting if ocho has a career day because he has been forgotten the whole season.thats just the type of plan belechick would come up with.my question is,will the g-men have ocho contained.i love the g-men in this superbowl to win it big,but my keys are the g-men go up by 10 or 14 early and not have to come from behind to win,even though they are capable of doing just that,,thats not the way to go.g-men will need to strike first and often and not give us the heart attacks we have grown to know.especially in the superbowl sunday.i still like my score prediction.g-men 37-patriots 14.in the words of strahan,believe it,and it will happen,i believe it and im all in. I’m sure the Giants will keep an eye on Chad. The main weapons for the Patriots are Gronkowski and Welker, second tier being Green-Ellis and Hernandez and the rest fall into a third tier in my opinion. The Patriots will have their hands full too with all of the Giants weapons on offense. In the voice of chazz pamentieri,spoken like a true gentlemen,lol.and i agree. Are you going to write a twas the night before superbowl article. Hey Bobby, yes I will do another one of those war poems before the Super Bowl. I will post it tomorrow when I write it out. At first glance this article seems a little biased, but you did list one person picking the Patriots, so I guess its a fair report lol. That was good josh lol. lol yeah Bobby Josh is a cool guy. He is one of the originals around here and gets respect. Hey Josh, thanks for the vote of confidence buddy. You know something, you are correct about everyone picking the Giants to win. I guess my twitter timeline is filled with informed NFL fans who predict a very good outcome for Big Blue. This game is about winning the Super Bowl and nothing else. Manning is going to play out his mind on Sunday.